Hitting the leg of the person next to you (while laughing out loud) repeatedly during a performance is a good sign. My stinging palm is proof that God of Carnage, at the Bernard Jacobs Theatre, is an absolute delight. This French expose of modern marriage is written by Yasmina Reza (translated by Christopher Hampton) and directed by Matthew Warchus (Boeing Boeing, Follies, and numerous West End productions.) Set in Cobble Hill Brooklyn in 90 minutes of real time, there is never a dull moment. It seems dismissive to describe Ms. Reza’s work as a 21st century Who’s Afraid of Virginia Woolf, but somewhat apt. Perhaps any theatrical construct of two married couples exposing the underbelly of their selves and their marital dynamics is going to conjure Edward Albee. In the case of God of Carnage it was the fierce humor, and quite frankly, the drinking, that whispered “Virginia Woolf” repeatedly. But that reference is merely a jumping off point for this play. 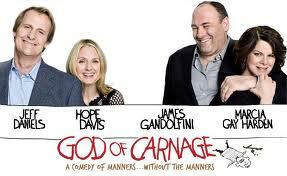 Without resorting to Lifetime movie tactics, God of Carnage manages to tackle; bullying, gangs, violence and social class while never losing its humor or dramatic interest. The fact that the evening stays above the sentimental fray must be greatly credited to the incredible cast. Hope Davis and Jeff Daniels as one couple and Marcia Gay Harden and James Gandolfini as the other couple. Not enough can be said about the sheer delight in watching these four very talented people. Ms. Harden has a luscious role and plays it like a virtuoso; she is hysterical and heartbreaking and infuriating. As difficult as it is to take ones eyes off of Ms. Harden, this truly is an ensemble piece and it is clear that this quartet is having the time of their lives. It speaks volumes to me that during repeated silences, the acting was equally as riveting as it was during the explosions. I strongly recommend seeing this production, and seeing it with someone who does not bruise easily.